What is a Learning Leader? 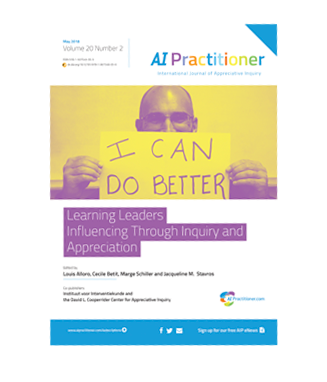 The articles in this special issue illustrate the relationship of learning leaders and Appreciative Inquiry in diverse ways from different contexts, organizations and age cohorts. Some demonstrate the core principle of co-construction – connecting with others to learn and live in the multiple, inclusive ‘we’, rather than the singular ‘I’, exploring and embracing concepts from multiple sources. Never miss a the latest issue! Subscribe to AI Practitioner and receive all 4 issues of 2018 automatically in your account once published.